‘Mini-bus opens new field for city firm’ – says the Sheffield Telegraph newspaper in January 1966. Sheffield Transport had agreed to buy a prototype of a new design of a small bus developed by Cravens Ltd, a Company which had built a number of single and double deck bodies for Sheffield before and after the second world war. This new design would enable the Company to produce a range of different capacity buses with up to 33 seats. So far as I am aware, it remained unique. It was certainly the only Bedford bus to be operated by Sheffield. The bus was originally used by the Transport Committee and for private hire but it later it did migrate on to normal service. I remember it especially on the circuitous route 44 to Bakewell via Ladybower and Bamford which wasn’t noted for a lot of patronage. I’m sure it must have been adapted later for one man operation as I remember the 44 being an early OMO conversion. 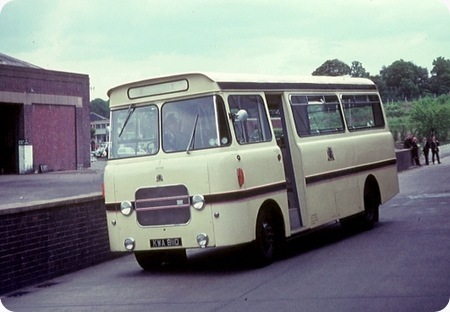 However here is the bus outside East Bank Garage on 19 June 1966 (it must have been nearly new) on the occasion of a tour of Sheffield by the Leeds and District Transport News. The bus was renumbered 1 in April 1967 and was sold to the local King Edward VII Grammar School in 1973 – presumably at the expiry of its first seven year certificate of fitness. An interesting might have been. Looks ungainly now and I fear it did then as well. Looks as if it ought to have a wheelchair lift in the back (needs it with that step!). The test here is whether it felt like a van with seats or a coachbuilt….coach. Small buses/coaches are fine, if that is what they are, and don’t shake themselves (and their passengers) to bits. Ian, your final paragraph stuns me. I left KES in the summer of 1971 and kept in touch, through two members of staff in particular, who were mentors and very important to me with my professional development. …..and yet I wasn’t aware of this. I am a professional musician and retired music teacher – so one was the Head of Music. The other was an incredible guy who was also an MOT approved driving instructor, and advanced motorist, drove part-time for the real SUT and was a qualified fitter. Alan Finch got me through both the initial MOT and then the advanced driving tests first time and instilled in me a love of, and pride in, driving well and safely. Presumably he was instrumental in this purchase – but it seems to have passed me by. Sadly Alan died a couple of years ago. Bearing in mind it was built at the same time that Cravens opened their Neepsend Coachworks and supplied a number of Atlanteans (PDR1/2) to Sheffield, it always puzzled me that No 11 was built by "Cravens" Do we assume it was Cravens Homaloy – the unit that built commercial vehicle bodies and trailers? Seem to recall that the local enthusiasts used to call this vehicle the"Cabbage Wagon"
Ian is quite right about most of the operational details. However, it was never converted for OMO use. A short time before it was withdrawn, I travelled home from work to on Weedon Street in the East End. On this particular occasion the Bedford/Craven 22 seater duplicated a Leyland Leopard/Burlingham 41 seater OMO saloon. Opting for the trip on 22, I was astonished that the vehicle was crew operated! Not a very economical bus for service! Last time I saw it, was in ‘79 and was owned by Greenthorpes garage at Darnall, incidentally 500 yards from where it was built! It was painted light turquoise blue with a darker blue band, and was named "Georgie Porgie"! Shame it wasn’t preserved as it was the last bus ever built by Cravens of Sheffield, but the last owners’ extortionate asking price resulted in no buyers and it eventually went for scrap. Can’t put a date to this recollection but I remember seeing this bus parked on the drive of a house in Barnburgh, a small village about 18 miles from Sheffield. Whether this was before or after Chris saw it at Darnall I can’t say. I took slides of no 1 working service 190, Alsing Road to Darnall (terminated in Britannia Road) an also screened up for service 44. The body was built at the old Cravens works in Staniforth Road and adverts showed it as being a Cravens Homaloy body. I hesitate to argue with the mighty Keith Beeden, but it was definitely converted for OMO latterly, certainly by 1972. I travelled on it on the 44 at that stage. It was fitted up, as most Sheffield OMO buses were, for a TIM ticket machine- but not a powered one. I believe it only had a 12v electrical system whereas all other buses had the 24v necessary to drive a TIM power unit. I think its duty included trips on the 190, referred to above, before and after the couple of round trips on the 44 which were the entire M-F service on that route. It wasn’t used at weekends. There is an unconfirmed story that STD had an option on a second such bus which would have been used to provide Edale with a rail replacement bus service when BR applied to withdraw the Hope Valley local trains in 1966. When it was found that the replacement buses would cost more than retaining the trains, BR decided not to proceed with this plan and No1 remained unique. In reply to Phil Drake I appreciate his statement that the Sheffield Bedford number 1 was indeed OMO converted. Possibly my journey was taken when the equipment was not serviceable? Bedford VAS1. How many of these were built? Astons Coaches Marton had a Reading DRY 7877C (re-registered for some reason), Bodied one ex Davis Leicestershire who had two. How many Reading bodied ones were built? Typo on the registration I think, four numbers, probably a 7 too many.